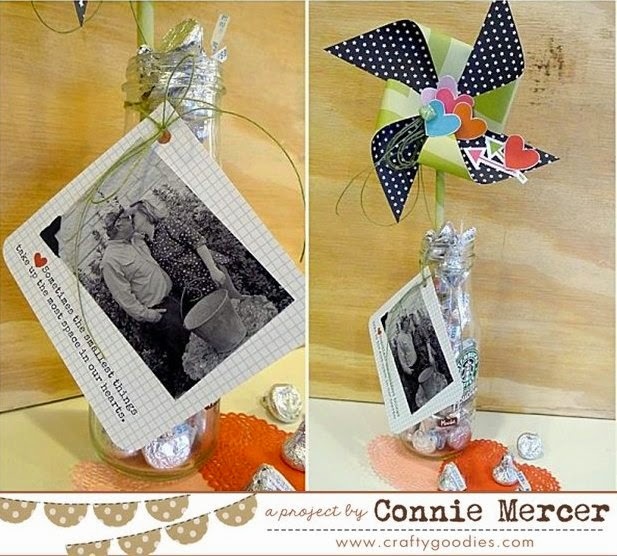 crafty goodies: Starbucks Bottle and Bella Blvd~ Pinwheel Treat! I have one last project to share for Valentine's Day! It is simple and "way cool"!! 1. Cut paper (Bella Blvd~Daily Chevies & Everyday Bits) into a 6" X 6" square. 2. Cut from the corner to the center, a straight line, leaving the size of a quarter in the center. 3. Do all four corners of the square. 4. Use a glue dot and tag one corner to the center of the pinwheel. Do all corners. 6. Wrap a dowel stick (1/4" X 12 ") with pattern paper. 7. Create a tag ! 8. Fill the Starbucks bottle with Hershey Kisses. What a great gift! Love it and you can't ever go wrong with pinwheels and chocolate. Loveeeeeeeee this! LOVING the pinwheel and that tag!!!!!!!!!!! aww that picture is so swest and the pinwheel is adorable.. Wonderful project!!!! Hope you had a fab Valentine's Day!